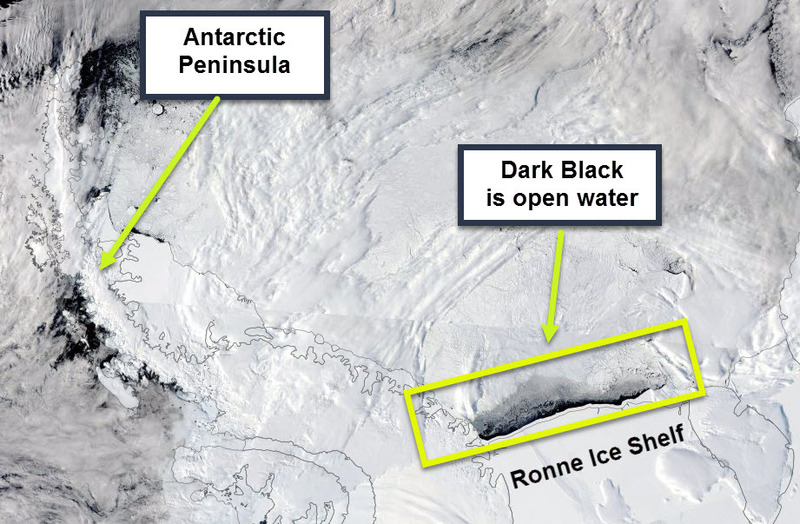 I noticed yesterday that a polynya had formed in front of the Ronne Ice Shelf over the last 2 weeks. In that image it is about 27,000 km2 in area. I mapped the opening of the polynya from MODIS imagery over the last two weeks. There is cloud in the images but the opening of the polynya is fairly clear. Formation of the Ronne Polynya 30 January to 14 February 2017. On 31 January 2017 there is no open water, but then over the 16 day period it opens to the ~27,000 km2 in area. If you're eagle eyed you can see that there is thin frazil ice forming in the open water in front of the ice shelf at the end of the sequence. Posted in Science. Tags: antarctica, frazil ice, heat flux, polynya, Ronne Ice Shelf, ROPEX, Weddell Sea on February 17, 2017 by Mark Brandon.